How do I disable /sitecore access on a Content Delivery Server? Content Delivery - the live site pointing to the web database. Content Management - the internal only site pointing to the master database. I want to prevent access to /sitecore on the live site, and require Content Editors to access this from the Content Management server. How can I lock this down to prevent access from the Content Delivery server? This contains a collection of documents relevant to your version of Sitecore. Second is The Security Hardening Guide which is the defacto guide for locking down and securing a Content Delivery server. Last, part of the process of locking down a content delivery server is removing all references to the master database. There is a config SwitchMastertoWeb.config.disabled that should be included somewhere in your config solution. Rename that to SwitchMasterToWeb.config and that will remove master from the server references. While the above answers are correct; you should concern yourself with more than just restricting access to the /sitecore folder - there is a very quick and easy way to achieve what you are specifically asking for. 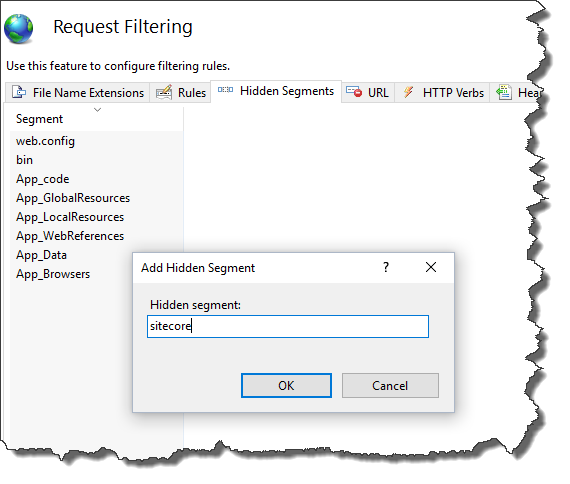 Go to "Request Filtering" on your site in IIS. Add "sitecore" as a hidden segment. You have now effectively blocked access to the /sitecore folder. I use this option a lot, because it's quick to toggle on and off. In many real life situations, it is helpful for debugging purposes to be able to access /sitecore on a CD box - so I toggle this while debugging, then blocking it when I'm done. This is really nice as we can just toggle it on and off if needed and it's deployed in our web.config as part of our deployment package from our build server. It might be a good idea to check the complete security hardening guide. And the guide on how to setup a Content Delivery server (mostly disabling certain features that should not run on a CD). Not the answer you're looking for? Browse other questions tagged sitecore-client configuration security or ask your own question. What is Sitecore Live Mode? Can the ViewState be encrypted on the Content Management server?